Michelin North America, Inc. (“Michelin”) created the annual Michelin Challenge Design™ to celebrate, promote, publicize and give visibility to original creative thinking and innovation in vehicle design. The displays from international entries for 2011 NAIAS look like another success. 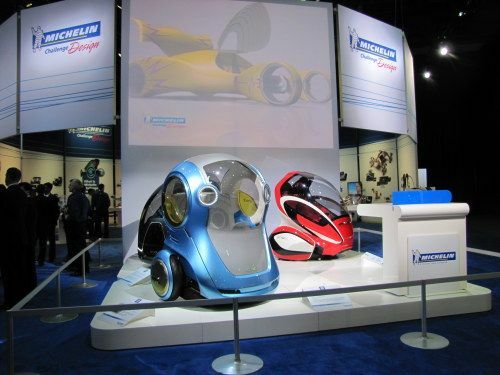 According to the personnel on hand at the 2011 Detroit Auto Show, Michelin Challenge Design is a collection of events and activities reflecting Michelin North America’s interest in and commitment to innovative design. This mainly due to Michelin’s corporate culture, which places a high value on design and innovation, and deems them as important to consumer satisfaction. Perhaps it's this attitude and philosophy that has maintained Michelin’s role as the industry leader. Utilizing their position as a leading member of the automotive industry and their unique position as a non-OEM exhibitor at the North American International Auto Show (NAIAS), Michelin offers a challenge to designers around the world, individuals and small and large companies, to enthusiastically create, bring forward and display, significant design work that would normally not have an opportunity to be shown at a major auto show. One look at the displays in the gallery below says the Michelin Challenge design program is worth the effort.